On December 16th, after only a few hours sleep, I was awoken by someone falling and crashing in the kitchen. I looked at the clock, it was 4am and my heart was racing. I groaned and shoved my face back into my pillow. I closed my eyes but I knew it was hopeless. I was scheduled to take my PMP exam this afternoon and I would be too nervous to settle down now. Still for the next four hours I stubbornly fought to fall back asleep again. At 8am I crawled out of bed defeated. I couldn’t cancel the day of the exam without losing the hundreds of dollars that was paid for it but I also couldn’t help but feel that my chances of passing this exam would be slim. I am good at taking exams. I don’t tend to get to anxious and I’m good at studying. I’d just finished my masters and I had exams down to a fine art. That being said I was still really nervous about this exam. For one thing everyone seemed to say it was really hard. I knew smart experienced people often didn’t pass it. I also had a lot riding on it. My work place had paid for a two week boot camp and was fronting my initial exam fee. I felt like I had to pass to make that investment worth it. Finally, after three years of grad school I’d had enough of studying to last a lifetime and I couldn’t face another month or two of cramming. Christmas was coming and I was determined to not study through it. This wasn’t the first time I had encountered PMI’s project methodology material. Back in 2008 I had received an online certificate from the local college and in 2013 I had taken a project management for IT course. I should know the material. Still there were changes with the new version of the PMBOK5 and I had been told that it wasn’t enough to know the material I had to know how the exam creators wanted me to interpret the material, and truthfully this perspective did not always seem logical. Still, I’d studied quite a bit. The PMP boot camp was five days and taught by a very experienced project manager from Seven Wonders Learning. I left the class feeling much more comfortable with the material but I still felt that I had a lot more studying to do before I was ready for the exam. I scheduled my exam for three weeks later knowing that if I waited too long I would lose momentum and would have to start over months later, but this time without the boot camp. I read through the slides from the class, retook the class quizzes, reread or skimmed the chapters from Rita’s book and took the end of chapter exams. Two weeks in I started taking free full length exams on the Exam Central site. I practiced laying out the process chart cards a couple of times each day. I struggled with the procurement chapter but found a video online that was helpful in understand when to use each one. At the end of this I felt simultaneously ready and like I could study for another month. That afternoon I arrived early at the Prometric exam center. They brought me in early and had me put everything I had in a locker, including my snacks and a water. I had four hours to take the exam and once the clock started it wouldn’t stop for anything, including bathroom and water breaks. I was checked thoroughly and then escorted into a small, airless room about the size of a closet. The exam center is used for administering many types of exams so the room was mostly full of test takers along with the myriad of little coughing and typing noises that a small room crammed with people in cubicles are inevitably filled with. Typing, shifting, coughing and the incessant opening and shutting of the door I had been placed right next two. I put in the ear plugs I had brought, eschewing the large noise cancelling headphones. I had a pad of paper, pencil, and two carefully allocated Kleenexes. If I needed more I’d have to use these and then request more from the apathetically friendly young people manning the center. I can’t tell you anything specific about the test itself but I will tell you my impressions. My guess is that there is a large bank of exam questions that the exam randomly pulls from. Although I’m sure the questions are meted out according to a percentage by knowledge area, the questions within that knowledge area may very well be similar. For many topics I felt that I got asked essentially the same questions over and over again. My advice is go with the best answer even if it seems unlikely since you just answered it three times prior. Unfortunately this may mean that if you don’t know something it may have a disproportionate impact on you as you could get the same thing wrong more than once. Another thing I realized is that there are “tricks” in the questions but mine weren’t overly devious. I had been given the advice to read the last two sentences at the end of long questions and figure out what they are trying to ask before reading the whole thing. This was good advice. Many people run out of time and I think that this is because they start jumping into complex analyses or calculations with out realizing that there was some wording that let you know the answer, often with no calculations at all. I was only really caught out trying to over complicate a question once. I quickly realized that calculating the paths given me in one of the network diagram questions was a fools errand that would take me 20 minutes. A quick re-scan of the question revealed information that made the hairy seeming question very very simple. After two hours of intense concentration I finished my first pass through of the exam. I left the room for a short break and came back to review my marked answers. At that point I was so tired that I realized I was changing them to wrong answers, so I changed them back and gave up on going back to them. I realized that I was over thinking it. I was nervous to hit that done button as it is so very final, but I realized I just had to do it and live with the result. After an agonizing survey the result came up that I had passed on my screen. It was all I could do not to cry in gratitude. I left the testing center wrung out but elated. It was done, over. I proud moment for me. 2) Do study hard – Although the test didn’t seem that hard to me, you do need to really know the material. Don’t think you can just get by on experience or a cursory familiarity. You need to at least get a good study guide and understand how PMI views project management and each knowledge area. 3) Beware of tricks but don’t think you can’t catch them. They really aren’t that devious. Just be aware that they will try to distract you with unnecessary information to get you to go into automatic, especially with calculations. You are smart enough to laugh at them, get the right answer, and move on. 4) Don’t endlessly add to your material – At some point you will have everything covered. Some people I know kept adding books and apps but in the end you just need to get the bases covered and study what you have really well rather than try and study everything out there. 5) Don’t lose sleep over it. If you are prepared and manage your time well you will do fine. If you do lose sleep like I did, try not to lose all hope. Apparently it can still be done. So what was your experience studying and taking the PMP? What did you find the most helpful? Do you have any advice for those getting ready to sit for it? As I mentioned in my last post I plan to take the PMP exam in November or December of this year and after doing a little research on how and when to start preparing I realized that this will be a process. Most posts I’ve read indicated that the study period for this exam should be about three months, so I’m starting now. There are many ways to prepare for the exam. The first step is to get the PMBOK 5 and prepare for some serious memorization. In addition, there are a number of boot camps, online prep courses and exam guides that you can purchase. They are all expensive and all new, since everyone has had to frantically revamp their curriculum over the last eight months with the release of the new edition of the PMBOK. This situation makes me a little uncomfortable since I feel like the guinea pig who will test out whether these courses are really aligned appropriately to the content of the new exam rolling out starting in August. I’ve put that aside though, as there is no point in worrying about it. The stars are aligning for 2013 and I won’t let myself get derailed. In addition to the pay options I’ve also frequently seen the recommendation to try and get into a study group. Hopefully I’ll be able to talk some co-workers into giving up some play time to form one. I’ll let you know how that goes. I will probably try multiple approaches and to start I’ve purchased the eighth edition of Rita Mulcahy’s PMP Exam Prep. The list price on this book is $99 but I got it new for $89 on Amazon. Not a huge savings but not bad given it was just released. I didn’t spend a ton of time researching each different exam prep book out there, and I’m sure there are plenty of good ones. I had an older edition of Rita’s prep book before and I liked it. Rita and her books are also generally well respected. The only hesitation I had was in knowing that since Rita had tragically passed away from cancer in 2010, this book wasn’t really written by her. Instead the book was written by an eight person committee of contributors at the organization that she established, known as the RMC. I’m usually pretty suspect of anything done by committee, but honestly it is probably the case that most books are written this way so I’m giving it a try. I just received the book in the mail on Friday and I’ve not really dived into it yet. I have gone through it though to get an idea of what it has to offer and I’m going to summarize what I’ve found here in this post. The book opens with the ‘tricks of the trade’, which are basically tips on how to study for the exam. Chapter 2 & 3 outline the processes and framework from the PMBOK, which can be pretty overwhelming for the uninitiated. These chapters also include different charts and exercises aimed at helping you try and get a handle on the overall paradigm that the PMBOK follows. Chapters 4 through 13 each tackle a knowledge area in depth and include a short exam on that area at the end of each chapter. Chapter 14 discusses the professional and social responsibilities of a PMP certified professional. Finally, the last section provides more tips, this time for passing the exam. The book also includes as CD with practices exam questions (1500+ according to the package). A big selling point of the book is that the tone is written in a conversational style. Compared to the dry and technical style that the PMBOK is written in, the conversational style is much easier to read. The book purportedly also delves into nuances of the material that shows an experienced project managers interpretation of the PMBOK knowledge areas, a perspective necessary for harder questions that go beyond rote memorization of the knowledge areas and PMBOK framework. I will try to let you know how things go once I actually start studying the book and using the exam prep CD. Are you planning on studying, or are you currently studying, for the PMP exam? What methods are you using and how did you like them? Although it took me awhile to get into Rita’s book, I did end up finding it helpful in the end. Although the CD ended up only having a handful of practice questions and not the 1500+ I thought I was getting, the end of the chapter questions in the book were very helpful. To get the 1500+ questions I would have had to fork over another $300. Instead I just used Exam Central which is free and one of the better banks of questions available online. I didn’t end up doing the exercises in the earlier chapters as I found them more frustrating than useful, but that might just be me. The exercises in the later chapters were more focused and helpful. Try to Contain Your Excitement…I’m Back! Well, it is hard to believe that my last post was in January of this year. At that time I had just started my final semester of grad school and looking for a position as a project manager. In February, I achieved my goal and started working as a Technical Project Manager. The beginning of this year was an exciting but also overwhelming time for me and, much to my regret, I just couldn’t find the time or energy to keep up with my blog. I decided to take a break from blogging but I never intended to take this long of a break. Time just flew by and now it is almost the end of summer. Thankfully my life has begun to take on a slower pace. I have finished up school as well as my first few projects at my new job and I’m beginning to take a look around me to find out what is next on the horizon. My next goal is to get my PMP certification at the end of this year and I’m excited to be able to just focus on project management. This is also an excellent time to start posting to my blog again as I will have a lot to write about and to discuss with you. Dear readers, thank you so much for your patience with me over the last six months or so. I will do my best to make your dedication worth it. I also am coming back to this blog with a different perspective than I had before. As a Business Systems Analyst I was experienced enough to be running projects but I was running them from the perspective of someone doing much of the project work. I was working with relatively small, local teams and I had a good knowledge of the technology I was working with. In my new position I’m working with technology I have no familiarity with as I moved from working with Oracle ERP to SAP, and the two are very different. I am finding that I have to rely more heavily on project management skills because I cannot rely on my technical knowledge to get through a project. What I’m trying to get at is that in a lot of ways I’m still very new at running projects as a full-time project manager. I expect that I have a lot to learn and I will make many mistakes along the way. Projects are challenging, and I have no doubt that I will find that some of my frustrations during projects will be directly related to how I am running them. I also expect that I will share some of those frustrations, and what I learn from them, here along with the basic material I will be working on as I study for the PMP exam. There are many project managers out there who have much more experience than I do and who will have different insights into the situations I write about. My hope is that they will comment on my posts and share their point of view. I tend to find I learn more from the comments people leave than I do reading the post they are attached to. In any case, I’m back and hope to continue this blog well into the future! Thank you for staying with me. The 5th edition of the PMBOK (Project Management Body of Knowledge) was released this month by the PMI and there are a few changes worth noting. The biggest change is that there is a new knowledge area called Stakeholder Management. This knowledge area replaces and expands on two processes from the 4th editions Communications Management knowledge area, Identify Stakeholders and Manage Stakeholder Expectations. It makes a lot of sense to me that Stakeholder Management would be its own knowledge area. Stakeholder management is an important and complex area in Project Management and it is frequently discussed in project management circles. I’m excited to see a focus on this area of knowledge and I look forward to diving into the material in the 5th edition PMBOK to learn the new standards. Some other changes include the addition to the Planning process group of the Plan Scope, Schedule, and Cost Management processes to the Scope, Time and Cost knowledge areas. There are also a few name changes to existing processes that improves naming consistency. There are other differences between the 4th and 5th editions but I will not go into them here. As I continue to explore the new guide I will post what I learn here. I’d love to hear from you. What differences have you noted between the two editions and what impact if any do you think they will have? The perception of autonomy leads to feelings of control. When we feel that we have a choice about the tasks we do we are more likely to be persistent and expend more energy in pursuit of our goal. In a project situation, the way in which team members are engaged in the process can have a big impact on feelings of control. For instance, during the SCRUM process if team members have chosen post-its off of the task board and put their names on them, they will feel much more autonomous than if a project schedule was handed to them with their name by a task. Even if they were the only one on the team who could have performed the task, it still feels like a choice if they call it out and claim it as their own. When we value the task or goal related to the activity we are more likely to pursue it. I know that I feel more engaged in tasks that I feel really add benefit to a project or to tasks that help me to grow in mastery. From a value perspective this is because I believe in being a contributing member to the betterment of society and I also believe strongly in continually pursuing growth, expertise and mastery. If tasks assigned to employees can be framed in a way that touches on that employee’s values and they can see the benefit of it, they are more likely to be motivated to do it. The more ability we have in doing a task the more we tend to enjoy it. This is especially true if we believe that hard work, rather than talent, leads to mastery and excellence. When I am first learning a new skill, such as learning a new instrument, I am eager to practice because I’m buoyed by the excitement of trying something new. After a few sessions however I find that making myself sit down to practice is difficult because the initial excitement has worn off and my competence level is low. Constantly making mistakes is frustrating. If I persist in practicing however my competence grows and I garner enjoyment from playing that instrument. This experience illustrates the idea that increased competence when performing an activity increases enjoyment, which in turn increases motivation. On a team, a manager may be able to increase a team members motivation by helping them to gain more competence though increased training and mentor-ship or by assigning them tasks where they have a high level of competency. I hope you find these suggestions helpful. What factors do you find help you maintain motivation on your team? Please leave me a comment and let me know. On any project there are risks. In many organizations project risk planning is completely overlooked. Project risk is defined by the PMI as “an uncertain event or condition that, if it occurs, has a positive or negative effect on a project’s objectives.” Note that risk is not just about negative event planning, but is also about planning for positive risks that may come up as opportunities. The process of identifying risk is really about getting everyone on the project together and getting their ideas on what could go right or wrong on the project. This can be done using common brainstorming methods or more advanced methods such as the Delphi technique. It is important during this process to try and be open to any suggestions that may be made, no matter how ridiculous they may seem at the moment. Once a list of risks has been created from this process it is important to try to analyze them to come up with risk score by deciding on a probability and rating the impact, and then multiplying them. Once each risk has a risk rating, you can focus on the top risks and come up with a response plan. For negative risks you can try and transfer the risk to another party, you can take actions to try and avoid the risk altogether, or you can come up with contingency plans to deal with the risk if it occurs. With positive risks you can put plans in place to try and make sure that it occurs. This is known as risk exploitation. The status of the risk, i.e. did it happen or was it avoided? Outside of the benefits avoiding risks altogether using this method, managers, customers and team members will have more confidence in the likelihood of a successful project outcome if they can see that a good risk management plan is in place. Various sources, such as the PMBOK guide, go into elaborate detail on how to plan, organize and control projects. Leadership is a different story. There is no clear guide to being a good leader. The ability to lead is rooted in the sum of the persons character, integrity and soft skills. The ability to lead is what sets great project managers apart and it is not a technique. The ability to lead is a part of the art of project management. Even though leadership is often only thought of from the point of view of the leader, a leader is nothing without followers. True follower-ship is a choice, and the choice to follow someone is not made willingly if that follower does not trust the person chosen to lead. Trust is the willingness of a person to be vulnerable and take risks. In order to do this a follower must see the leader as trustworthy, which requires that the follower sees the leader as having integrity, ability and benevolence toward them. Clear communication. When a leader communicates about an intention, it will be viewed as a promise by others. Effective leaders are clear about their meaning and as a result, do not mislead. Promises are treated seriously. When leaders treat commitments seriously, others do also. Forthright and candid behavior. If leaders are forthright and honest, others will have less reason to be angry or try to deceive in retaliation. So why is it important for a project manager to have the trust of their teams? I think this was well illustrated for me recently when a project manager mentioned that they have limited authority over team members because in the end they do not decide their employment, promotions, or raises. This means that they must lead their teams through influence. This insight reinforces that project managers, maybe even more than other managers, cannot rely on authority but must truly be leaders so that their team members will choose to follow them. 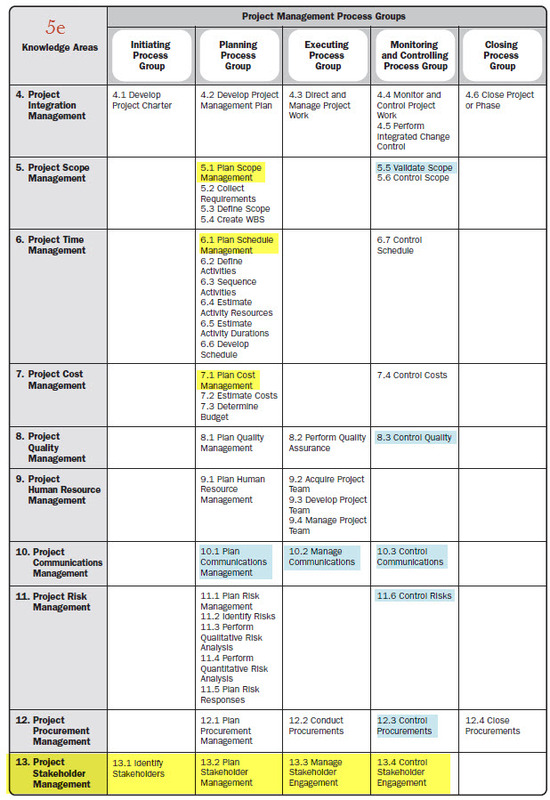 The core knowledge areas in the PMBOK guide make up the triple, or quadruple, constraint in project management. Scope is all of the work involved in creating the products of the project and the processes used to create them. Time refers to the project schedule and specifically when the project will need to be completed by. Cost is all about the project budget. How much will this project cost the company to complete? When tracking a project the project manager and everyone on the team, should be continuously asking questions throughout the project. These questions should be focused around the four core knowledge areas: scope, time, cost and quality. Scope – Is this in scope? Time – Is this on schedule? Quality – Does this meet the specifications? Cost – Are we under budget? If these questions are asked continuously then issues that will throw off any of these core project areas will be found and dealt with early. The key to good project management is to know that you are not done once you have created a project plan. There will always be change to deal with. This could be change from evolving customer requirements, changes in staffing, or changes in business due to changing priorities. Since change is a constant, asking these questions throughout a project can help a team to constantly monitor and adjust for these changes and this can mean the difference between project failure and success. 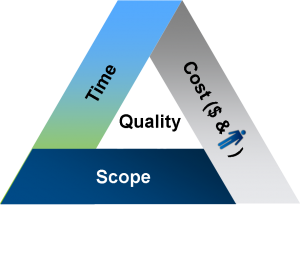 It can be challenging to manage time on projects for multiple reasons. There are many different people working simultaneously on a variety of activities at any given time during a project and there are any number of reasons why one or more of them might make demands on you. Under these conditions it is easy to lose control of your time during the day only to end up working evenings and weekends just to get work done. If you have piles of papers on your desk, or folders on your desktop, of documents that are a combination of relevant and irrelevant, you may find yourself spending time looking at ones that you don’t really need to deal with. This could be due to the fact that they are from old tasks that are no longer a priority. To help manage your time more effectively it helps to take the time to purge your work space of those documents that you don’t need to deal with. Setting boundaries with others is probably the most important thing you can do to manage your time. From that person who is always dropping by your office to just talk to you endlessly, to issues that are tossed in your lap at the last minute by someone who really should be working on it themselves. Taking the time to set boundaries with others will help set up good habits for how people treat your time. Block out time on your calendar for getting your work done. This will make sure that you have the time you need to complete your work. It also helps prevent you from becoming overbooked either from your own efforts or those of others. Jennifer Whitt in a webinar from www.projectmanager.com on the topic, “How to Track your Projects” suggests this one and the concept is really insightful. She said that she often blocks out some time in the morning for things like working out, meditating and planning. These activities make sure that she is taking care of herself and allows her to set her focus for the day. If you’d like some more tips on time management I’d recommend watching the hour long webinar mentioned in tip #4. How about you? What are some tips that you use for managing your time? Do You Have Your Blinders On? As a project manager do you have your blinders on? It is important when managing a project to remember that your project does not occur in a vacuum. With everything that needs to be done on a project it is crucial that the project manager and the project team understand where their project fits into the overall business. Throughout the project, and especially as the project gets more challenging or runs into problems, it will help to keep support for the project high if everyone understands and can communicate how the project will help the business achieve its business objectives. It also helps to view the project in terms of how it will fit into the overall systems that make up the various business processes that keep the business running on a day to day business. Understanding how the project will change and fit into the systems of the business will also help with understanding who the project stakeholders are, what possible risks and in evaluating the overall project value to the business. This concept of thinking of the business in terms of its systems is called systems thinking, and it is a holistic view of carrying out the projects within the context of the organization. Systems thinking is a topic that is near and dear to my heart as Business Systems Analyst. If you can take the time to define the scope of the system, evaluating its problems, opportunities, constraints and needs you can more easily understand the scope of your project within that system and how it will address them. I'm Heather Christian, MBA, PMP, CSM. Welcome to my blog about project management and the projects impacting the Reno community for the better.